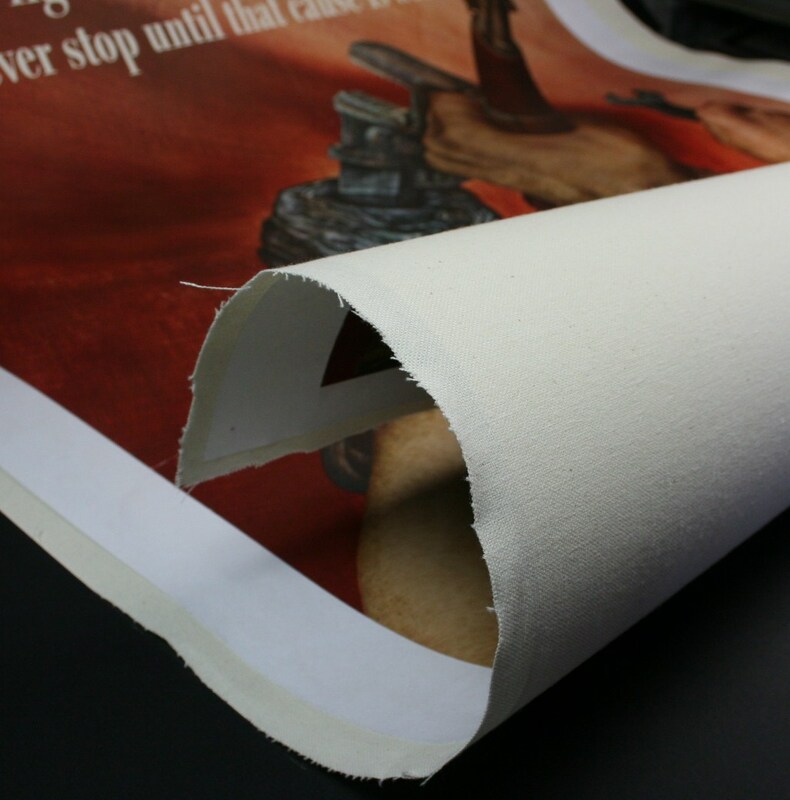 Linen Backing a poster on canvas requires three essential elements; Linen which is marketed as Cotton Duck:, acid free Japanese Lining paper and a Wheat starch solution containing an alkali buffer which when used together provide a stable acid free environment for mounting a poster. Because the wheat starch is soluble in water the process is fully reversible when soaked in water without causing any irreversible damage to the poster. Museums and conservationists refer to this process as Archival Mounting. Step 1. First we stretch the linen to stretcher bars much like an artist would stretch a canvas for a really big painting. Step 2.The Lining Paper is mounted to the canvas. 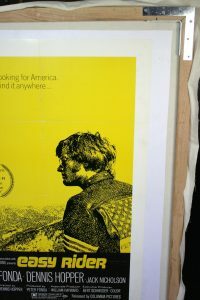 During the drying time the linen shrinks and forms a tight, wrinkle free surface for mounting the poster. Step 3. 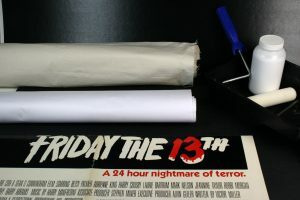 The Poster is then mounted to the Lining paper using the wheat starch glue and we wait again; this time for 2 or 3 days for everything to dry thoroughly – again shrinkage occurs stretching the fold lines so that they become less visible so that they don’t spoil the appearance of the poster. CLICK HERE if you have questions about condition. WHY BOTHER TO LINEN BACK A POSTER? Linen backing is first and foremost a preservation and stabilization technique. It preserves the integrity of old and valuable paper and assures the poster can be safely handled and displayed. 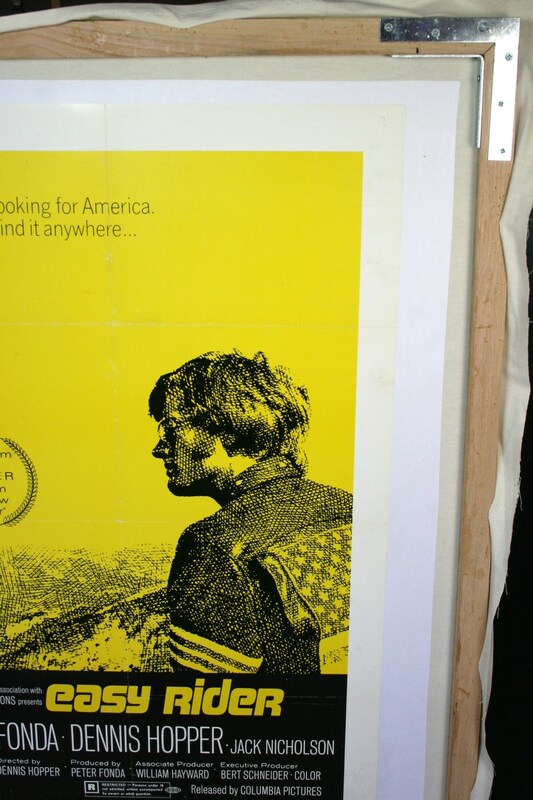 Posters are made from paper and with time paper becomes brittle and torn and often stained from natural acids in the paper pulp and from the atmosphere. To make matters worse people unknowingly use tape to hold tears together and this tape usually stains the poster as well. When we linen back posters harmful tape is removed and tears are fixed. If you choose restoration we can replace missing paper and remove most stains. If you want to make your poster more aesthetically pleasing and stabilize or even improve the value of the poster Contact Us! We are a ALL IN ONE shop, poster sales, Linen backing, Restoration, framing and display for you Media Room, Man Cave, Den, Game Room, Living Room WHATEVER, we can help. Contact Us with a description of your poster and if possible include a photo or two of your poster. We will respond within a day or two with a price quote and if you decide to proceed we will send you a Work Order for your approval via email and provide you a shipping address. Once we receive your poster we will let you know so you don’t have to worry about whether the poster got lost in the mail! If you live in the Houston area you can simply bring the poster to our poster gallery at the Limited Edition in Katy, Texas. Please allow a minimum of 10 days to complete the work. Once complete we will send you a photo of your linen backed poster and an invoice for you to pay. You can pay with online with Paypal or call the shop with your credit card details. As soon as we receive payment for the work plus packaging and shipping we will mail the poster to you in a sturdy tube. $50.00/per Australian Day Bill or Belgian Movie Poster. Please keep in mind that we do not linen back or frame six-sheet posters or larger due to a lack of physical space!